Connect. Camp. Community. These three words define Victory Lane Camp, and the VLC summer session at Cornerstone demonstrated this focus. From a dance party to the campfire songs, families came together to grow into a long-lasting community. 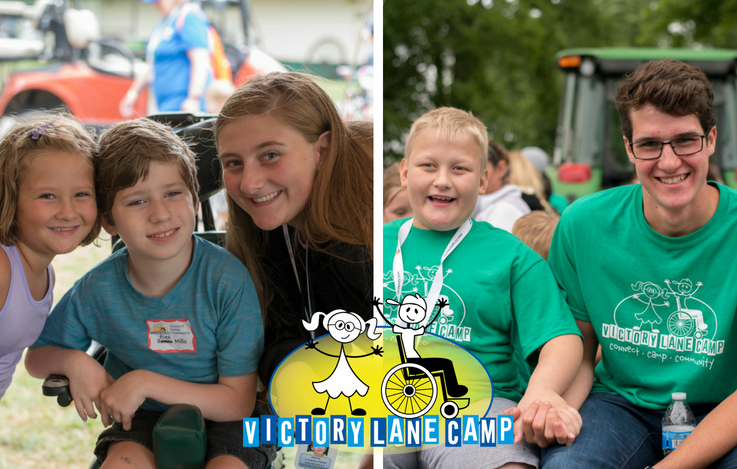 This session at Cornerstone Campground in New Castle, Indiana, included 15 Serving Families and 10 Victory Families. All the families connected right away as they shared meals together and participated in a variety of activities. “We had a few families this year that would stay at the tables long after the meal was done just talking and building community. It was beautiful,” explained Tiffanny Youngquist, VLC’s Assistant Director. Even in the midst of the rain that poured during the session, families continued to gather and build relationships. When the rain would start, all the families would congregate under a tent where they would still be able to have the campfires, meals, and other activities. Camp participants were excited about the movie dance party planned for Friday evening, but because of the rain it was held underneath the tent. Having the dance party under the tent didn’t discourage anyone, but only got people more excited to be together. One of the camp’s “rock stars” was young Eva, a Victory Kid. During free time on Thursday, kids were encouraged to make their own instruments for the evening’s campfire. During campfire time, song leader Mike Brown invited the kids to join him in a percussion band. Eva found two rocks and jumped out of her chair, announcing that she was going to be in the “rock” band. Each night after, Eva would bring her two rocks to campfire and “rock it out” with Mike and the rest of her “rock” band. Another favorite memory happened during the Silly Safaris program when Jameson, a 10-year-old with autism, enthusiastically volunteered to pet a slimy tree frog. Kinkajou Katie from Silly Safaris asked Jameson to kiss the frog to see if it would change into a princess. “Jameson kissed the frog without hesitation, but to his disappointment, the frog is still just a frog,” remembered Tiffanny. Moments like these, along with other activities and training sessions, gave families a chance to grow closer to other families. Beyond that, they grew in relationships within their own families. By enriching relationships both within families and among other families, the impact of the Cornerstone summer session will go far beyond the four days of camp. “There are a lot of people to thank for having this week of camp happening,” Tiffanny expressed with gratitude.